1. As you can see, for the month between December 24, 1998 and January 24, 1998, there were only eight full days of school. Hae was in attendance for seven of those days (obviously, she wasn't in school on January 19, 1999). Adnan was in attendance for six of those days (absent two days from January 4-7, 1999 [Update: absent January 4th and 6th]) [Update: Adnan was only in attendance five of those days because he was absent on January 19th)]. Hae and Adnan were both in school for five of those days (January 11-13, 1999 and the two days they were both in school from January 4-7, 1999). 2. The reason for Krista highlighting this information was to show that "many people who weren't close to [Hae] may not have realized that she was truly missing." As you can see, there was only one "regular" day of school between Hae's disappearance on January 13, 1999 and January 25, 1999. 3. As I've said, we have several people with recollections of seeing Hae and Adnan on certain days, such as Becky, Summer, Inez, Debbie, Asia, and Coach Sye. By referencing the above schedule, we can see the days when these encounters could (and couldn't) have occurred. For instance, let's take Debbie. Debbie remembers seeing Adnan at the guidance counselor's office after school. 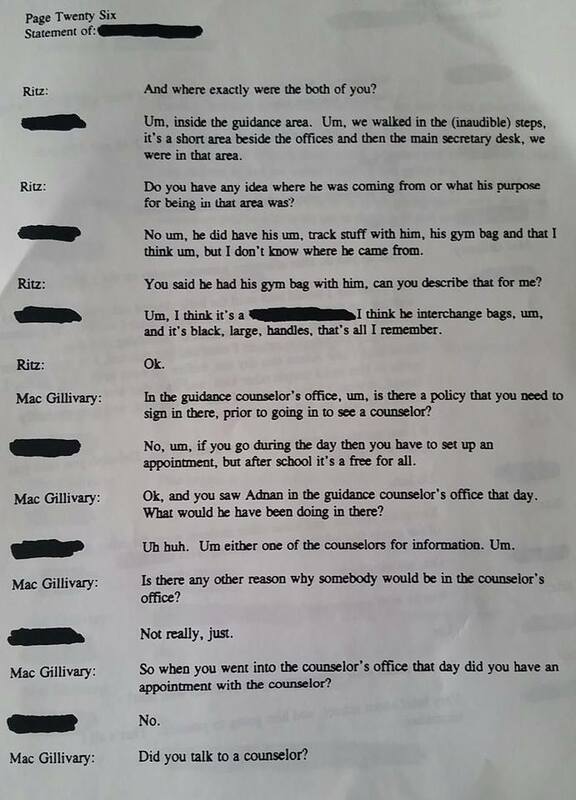 According to Debbie, Adnan had his gym bag with his track stuff, and they talked briefly about school and Adnan going to track practice. Debbie is initially positive that she saw Adnan on January 13, 1999, but she later says that it "could have been the day before or the day after." We also know that this encounter couldn't have been the day before because Woodlawn competed at the Baltimore County Relays on January 12th, meaning that there was no track practice that day. So, if Debbie is thinking about a day before January 13th, the latest day she could be remembering is January 11th. If Debbie isn't remembering January 11th, the next latest day she could be remembering is January 7th, six days before January 13th. Now, let's dig even deeper. Debbie remembers seeing Adnan at the guidance counselor's office and then seeing Hae as she was about to leave to pick up her cousin and go to a sporting event at another school. If Debbie is accurately remembering seeing Hae and Adnan on the same day and the nature of their conversations, she obviously can't be remembering January 19th or January 25th. If you believe that there was no Woodlawn wrestling match on January 13, 1999, Debbie likely can't be remembering that day either. 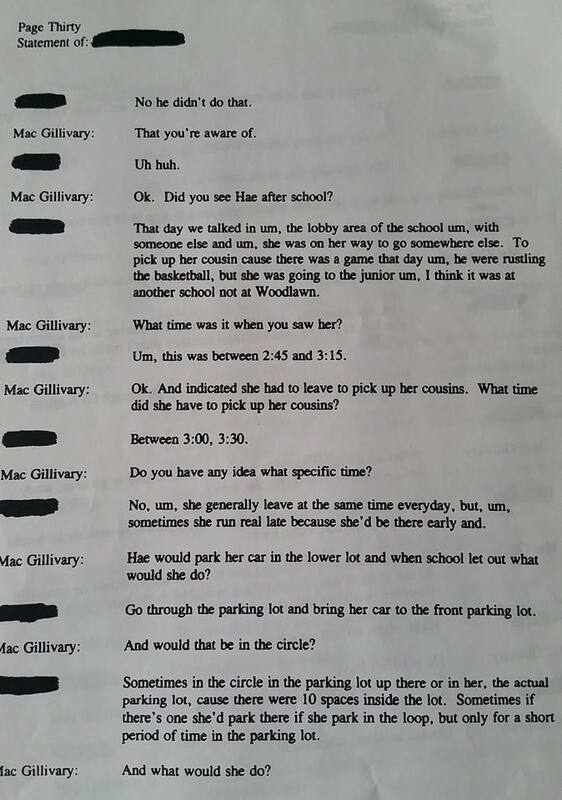 ** The same goes for Summer and Inez, both of whom remember seeing Hae on the day of a Woodlawn wrestling match. 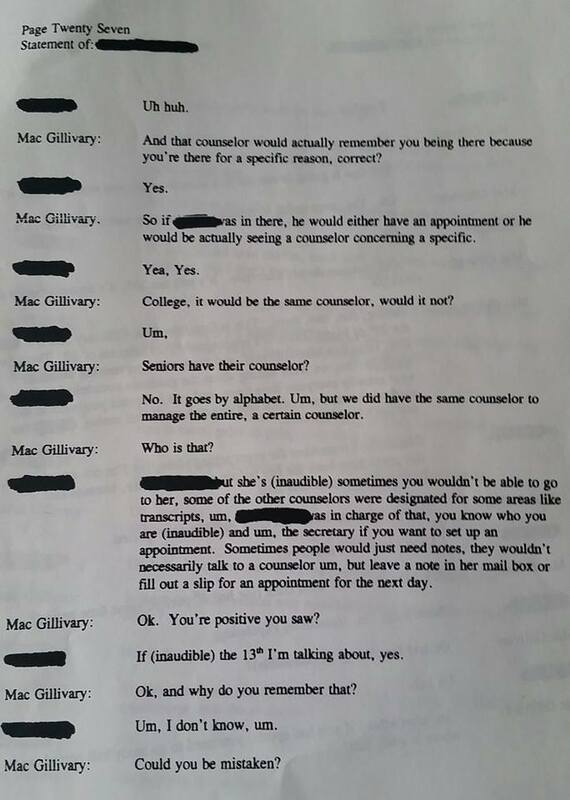 So, are any of these individuals correct that they saw Hae and/or Adnan on January 13, 1999? Maybe, maybe not. If not, we have an ever shrinking number of days on which these encounters could have occurred. *Debbie remembers seeing Adnan after the announcements at the end of school. I'm guessing this rules out the half-day exam days. Krista can't remember whether sports practices were held on exam days. **This is why I have speculated that Debbie could be remembering January 5, 1999, the day of the Randallstown wrestling match. ***Of course, for either of these days to be correct, Adnan would have been on his way to track meets, not track practices. Was Adnan at school on the 7th? Does Krista know that? All this talk about timelines and days at school and you continue to ignore the most important unknown. Was he at school on the 11th. SK knew, there is now way Rabia doesn't know. Why do you not have this information? EDIT BECAUSE I MADE A MISTAKE: Was Adnan at school on the 7th? Does Krista know that? All this talk about timelines and days at school and you continue to ignore the most important unknown. Was he at school on the 7th. SK knew but didnt realize (or ignored) its importance, there is now way Rabia doesn't know. Why do you not have this information? "Adnan was in attendance for six of those days (absent two days from January 4-7, 1999)." What is so important about the 11th? Why is it so important if Adnan was at school on the 11th? 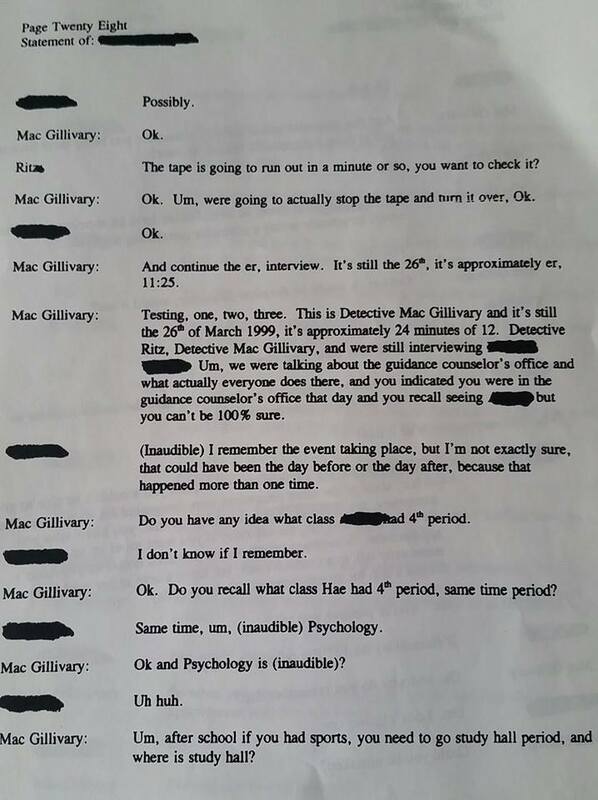 Don't you think if Adnan wasn't at track practice on the 13th, that that would have raised a red flag with many people right away? The fact that there was no mention of him not being there on the 13th is pretty good prove it wasn't him. I just updated the post. Adnan was absent January 4th and 6th. He was also absent January 19th. He was tardy on January 5th, 12th, and 25th. So Adnan was at school on January 7th, the day of the real first snow that Asia mentioned. It seems likely that if she saw him in the library, it was January 7th. When Asia wrote her letters (March 1st and 2nd, 1999) she remembered seeing Adnan on January 13th. When she signed her 1st affidavit (March 25, 2000), she remembered seeing Adnan on January 13th. In 2014/2015, Asia remembers seeing Adnan on January 13th for a few reasons, including her boyfriend being late to pick her up from the library. Some of her reasons relate to the weather, and some support January 7th while others support January 13th. For instance, she thinks she saw Adnan just before the first snow of the year, which is consistent with January 7th. 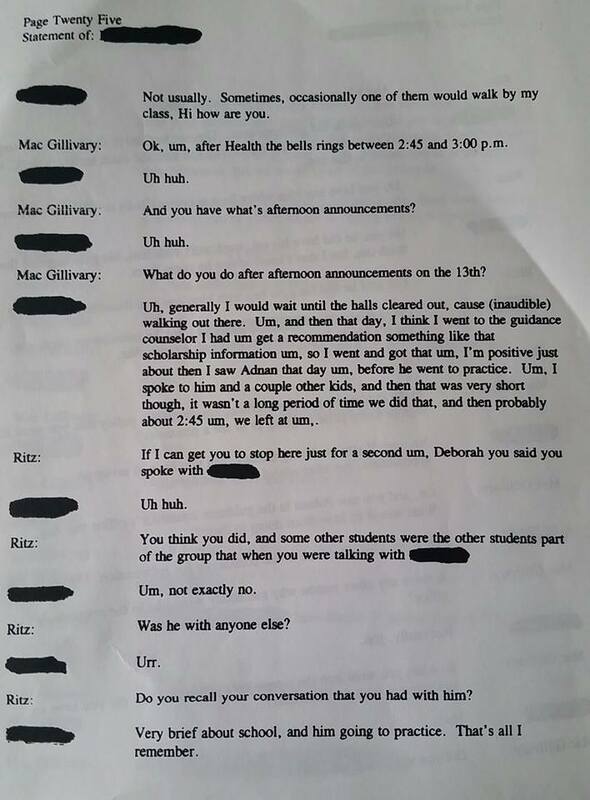 But she also thinks she saw Adnan before school was cancelled for two days, which is consistent with January 13th. You know, Colin - you and Susan are proving more alibi-crushing information ACCIDENTALLY than the police did in their entire investigation. Keep up the great work - and, together, we CAN keep The Woodlawn Strangler in prison! Jim: The truth is the truth, which is what I'm pursuing. That said, I don't really see how this is alibi-crushing. Asia stated on 3 occasions in 1999 and 2000 that she recalled seeing Adnan on January 13th. Then, in 2014/2015, she makes some statements that are alternately consistent with seeing Adnan on January 13th or January 7th. Is it possible Asia saw Adnan on January 7th? Absolutely. But I think that her seeing him on January 13th is far likelier. Hi Colin, I'm interested to know if Hae actually attended school or her last classes on 1/13. You are more than willing to accept that everyone who supports Adnan is talking about a different day (with no evidence to show that is true) but you refuse to accept any doubt about the memories (which clearly are challenged) of those who say they remember Adnan doing this or that. I think basically, every post you make suffers from the same obvious flaw-like a Fox news spin doctor. BTW, were you in collusion with wtfsherlock, when he secretly purged posters from the reddit serial forum? He seems to have been sticking up for you, and removing posters who were critical of you, even when they broke no rules. What's the deal with all these unexcused absences and tardies? We heard all about this over-bearing mother who is all over his business, and yet this guy is just doing school whenever he feels like it? Not only does this fly in the face of the "golden boy of the community" narrative, without a different explanation I wonder if somebody was a little more distraught over his break-up than he's letting on. Don't you reddit trolls have anything better to do? Curious: I think Debbie was confused. The class schedule I have posted is for the semester ending on 1/22/99. OK - The schedule posted on the Undisclosed website is dated 2/23/99. I figured that it could be either or. The time period (late 90's) makes the case very interesting in that if it happened 3-4 years later, there would be a lot more historical electronic information available. I was looking at the track schedule, which was finalized over the summer of 98. I was trying to find the results of the Baltimore County Relays (1/12/99 on the schedule), but couldn't find them. With all the snow days in January of 99, which is uncommon for the Baltimore/DC area, the meet itself could have been moved/postponed, but there really aren’t any records that I can find on that (internet). I’d love to see the track results, which would prove that the meet occurred on the date as scheduled. In the podcast, the team mentions Jay is told by Adnan that he "had to run a lot" at practice, which the team dismisses as a lie because Adnan was fasting and was restricted to light jogging. I have two issues/questions. I had a friend in high school (coincidentally named Adnan) that also fasted for Ramadan. There was no special treatment or alternative workout for him and we were on the swim team. Secondly, what events did Adnan run? If he was a sprinter, and the coach gave him light jogging as a workout, this can easily be interpreted by Adnan as him having to "run a lot", as sprint work outs are short blasts of speed, form running, starting blocks practice, etc. What I'm saying is, if a sprinter was told that his practice would be was to lightly jog 3 miles, that could be the light workout the coach gave him, but yet interpreted as running a lot. Just asking questions and thinking. Very interesting podcast. Would the snow days have thrown the A/B day schedule off? I employed a babysitter from a high school with that sort of schedule, and sometimes a holiday or an ice day shifted the A/B schedule over.